After I came back from my holiday in Aug, my hair was in such bad condition. Alot of it just snapped off, my bedroom floor was covered in hair, it was awful. The ends looked tattered. So I payed my lovely hair stylist a visit. Dear, Mac. Please bring back Lightscapade..
Ahh, it's so pretty! The swirls of pastels just work together to give the perfect sheen. I've not tried any highlighter like this. It gives the right amount of glow-ness without looking too shiny. But was it worth it? Yes! Although I'm quite stingy with it seeing as it was limited edition. C'mon, MAC. Make it happen! I picked up both of these products from Selfridges a while ago. I must say that I am thoroughly pleased with both of them even though they were VERY expensive. I picked up the Sheer Glow foundation in Stromboli which can be compared to MAC Nc35-40, but this has a lot more yellow in it. The consistency of this foundation is quite runny so it's easy to blend, I usually apply with my GOSH stipler brush. It just literally melts into the skin. The coverage is excellent! It covers all my acne scars. This foundation is formulated for dry or normal skin types but I think it's suitable for most skin types as I'm combination. I love the finish to this, my skin looks luminous and gives a natural finish. It lasts pretty much all day! The only downsides to it is by lunch time I need to blot my skin with mattifying papers as my skin starts looking oily which is okay compared to MAC's studiofix (Made me look oily-er :P) & this stuff isn't exactly cheap. I would repurchase this though as this is now my HG foundation! 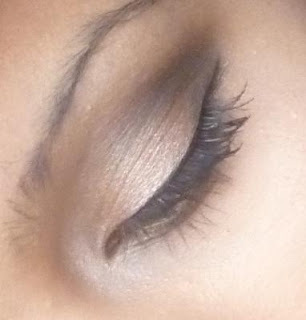 As you can see from the picture above, I've used a few shades from the Pleasures of Paris palette. LOVE! I've used Nepal all over the lid, Abyssnia on the inner corners and Cordura on the crease and outer corners. I have my eye on the NARS Belle De Jour and Striptease. Have any of you used it and what did you think of it? Aaanyway, I used UDPP all over the lid. MAC's Honey Lust all over the lid with small flat brush. Then with my ELF studio contouring brush, I applied MAC's Concrete (lightly) into the crease and blended. On the inner corners I applied Bourjois's Beige Rose. Gorgeous colour! After that, I lined my eyes with plain liquid liner and two coats of Collection 2000's Vinyl Lash Extension. Make up storage problem solved! Yeah, I know. I couldn't find a thing. So today I popped into Clas Ohlson and picked up a storage box which is actually meant for storing screws but whatevs. It cost £19.99 and it fit everything in! 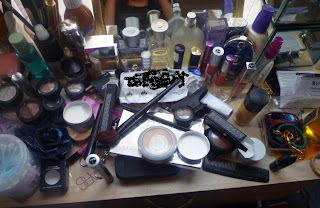 Even my palettes!